St. Martin's Griffin, 9781250169761, 320pp. From the author of The Balance Project comes a dual-timeline narrative featuring a 1949 Miss Subways contestant and a modern-day advertising executive whose careers and lives intersect. In 1949, dutiful and ambitious Charlotte's dream of a career in advertising is shattered when her father demands she help out with the family business. Meanwhile, Charlotte is swept into the glamorous world of the Miss Subways beauty contest, which promises irresistible opportunities with its Park Avenue luster and local fame status. But when her new friend—the intriguing and gorgeous fellow-participant Rose—does something unforgivable, Charlotte must make a heart-wrenching decision that will change the lives of those around her forever. Nearly 70 years later, outspoken advertising executive Olivia is pitching the NYC subways account in a last ditch effort to save her job at an advertising agency. When the charismatic boss she’s secretly in love with pits her against her misogynistic nemesis, Olivia’s urgent search for the winning strategy leads her to the historic Miss Subways campaign. As the pitch date closes in on her, Olivia finds herself dealing with a broken heart, an unlikely new love interest, and an unexpected personal connection to Miss Subways that could save her job—and her future. 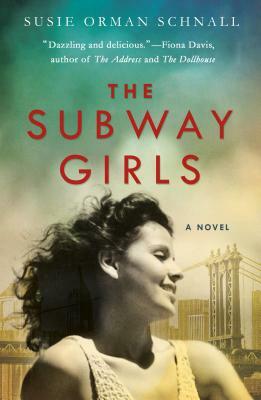 The Subway Girls is the charming story of two strong women, a generation apart, who find themselves up against the same eternal struggle to find an impossible balance between love, happiness, and ambition. Susie Orman Schnall grew up in Los Angeles and graduated from the University of Pennsylvania. Her writing has appeared in publications including The New York Times, The Huffington Post, POPSUGAR, Writer’s Digest, and Glamour. She is also the author of the award-winning novels On Grace and The Balance Project. Susie has spoken extensively on work-life balance and is the founder of The Balance Project interview series. She lives in Purchase, NY, with her husband and their three sons.